Ooobop’s first ever (mystery) GIVEAWAY! Some of the more beady-eye’d among you will probably have noticed a few changes going on at ooobop Towers! I have been doing some housekeeping… shock, horror, gasp! (Anything to avoid doing the real stuff!) In my inimitable style, it wasn’t broke so I decided to fix it anyway. And in the same way that I’d decorate a room to match the cushion – I needed to rebrand my blog to match my woven garment labels! WordPress has served me well over the last three years, from my early nervous ramblings to my latter day wafflings. And yes it has been a mighty three years. I can’t quite believe it myself. Especially since my sister-in-law, who knows me pretty well, said ‘You’ll never keep that up’! I’d like to think that she knew me well enough to know how positively I react to a red rag. Contrary? Me?! But true to the control freak that I will never admit to being, I wanted more control. The designer in me was begging to be fed more layout options; more fonts; more gallery options, maybe even a shop (later on down the line)… and I wanted to be able to see exactly who my lovely followers were. When you only have WordPress stats to go by, you can only see your WordPress followers and not everyone uses the same platform. And so I’ve gone self-hosted. I can’t say it was pain-free. Importing .xml’s, pretending I know what to do with a .php file and knowing that my DNS was pointing in the wrong direction… not really my bag! But I got here in the end. Of a fashion. And just like moving a real home there are still some boxes to unpack. Whilst all your wonderful comments came across, the number of comments did not so it looks as though nobody has commented on anything! And worst of all I have lost all my subscribers. Both WordPress and Email. Silly WordPress. But in the style of Baldrick, I have a cunning plan! I am hosting Ooobop’s first ever Giveaway! “What is it? What is it?” I hear you all chant. In fact it’s such a mystery, even I don’t know what it is as yet! All I can say is that it will be a truly lovely parcel containing all lovely things, sewing-related. This is a global giveaway. So it doesn’t matter where you are in the world. I will post. 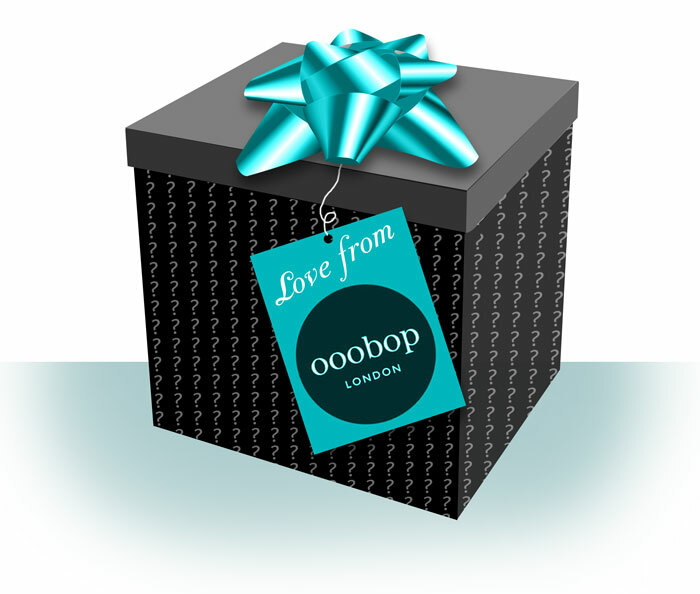 So if you like surprises and would like to keep up with my sewing adventures plus be in with a chance of a chance of winning this mystery giveaway, all you have to do is subscribe to ooobop, at the top of the right hand side bar, just under the search tool. Or if you prefer, by Bloglovin’ by clicking on the Bloglovin’ lady underneath. Then let me know in a comment, below this post, which method you have chosen and you will be entered for the giveaway. If you are an existing Bloglovin’ follower, please still let me know with a comment below if you want to be entered as this will be my go-to list of entries. The lucky winner will be ‘drawn from the hat’ on Wednesday 30th April 2014 and announced on Thursday 1st May 2014. Don’t forget to leave a link to your blog or an Email address so that you can be contacted with the good news and so that I can announce your prize-winning success! Thank you my lovelies, for sticking with me. I always get emosh when I think how much more to blogging there is when you have a blog. So many wonderful friendships, such amazing support and not to mention the plethora of talent that perpetually floods my inbox! I’m in for the long haul, kids! How exciting! And well done. Techy stuff like that terrifies me! I’m already a bloglovin follower and would love to be entered into the giveaway. The new site looks great! I’m also already a Bloglovin follower. I love a good mystery, so please do count me in! I follow via bloglovin’…and hoorah that your bloglovin’ followers got carried with the current over to your new self hosted blog! And boo about the comments not coming along too. As a rookie blogger, a year and a half in, I know that it’s the comments that create the connection! Fingers crossed that everything will sort itself out for you soon! Your blog design and layout looks great! Professional, but still personal! Ooh, how very exciting! The blog looks fantastic. I’m a Bloglovin’ follower and would love to be entered for the giveaway. Congrats! So admirable, all that fiddling with files. I’m in awe. I follow your inspiring adventures via bloglovin’, and very glad about that I am too. Congratulations. I have been following you on bloglovin’ for a long time, and would love to enter your giveaway. Oh Bop!! Clever Bloglovin’ brought me here directly like nothing had changed, then WOW!! Love what you’ve one with the new place! Your new webdesign is gorgeous. Great job! So nice of you to organise a giveaway! Thanks! I’m a bloglovin follower and have been for a while. You have incredible style and I really love your blog. Please enter me in the giveaway anything you choose will be amazing. I love that you’re revamping to coordinate with your labels! I have been following along on bloglovin for some time now, and when I went to re-up, it looks like bloglovin had already made sure that I continue to receive your feed. I hope that you don’t lose many followers. I’m sure they will find you. Hello..already following you on bloglovin. Like what you have to do site…lovely. Word if warning, more fonts, more choices. .it is addictive. Oooh, the intrigue! This is such a fun idea. I follow you on Bloglovin, and I can’t wait to see what the surprise is (even if I’m not the lucky winner). Love the new design & labels. Very professional! I’m an existing bloglovin follower. Can you put my name in the pot too???? I love your labels and your site design. Wish I had the time and know how to make my blog prettier. I’m an existing bloglovin follower and I love surprises! Loving the new look, especially the vintage looking banner! I already follow through Bloglovin and would love to be included in the giveaway. Already follow you with bloglovin. It’s all looking very polished, well done. Is it a turnip in the box? Great! I am an existing bloglovin’ follower and I’d love to be entered in the giveaway. I’m so curious already! Been following and will continue to follow! Congrats on the move! lmwvaatyahoodotcom Drop me in the pot please. I already follow you on Bloglovin. I love your new look! Your new site looks lovely and I’m looking forward to a peek iinto your wardrobe! Loving the new look! I’ve been following you via Bloglovin for a while. The new design looks great! And sewing surprises are always fun! I already follow you on bloglovin. Congratulations on the move, & your new slick home! 🙂 I love the clean lines & white spaces. All the best with unpacking the remaining boxes, I’ve managed to keep you on my WordPress Reader, even though you’ve moved. Hi! I’m following your blog on bloglovin in Oz. I’d love to enter your giveaway. Fingers crossed! The new blog is looking good, I already follow you on Bloglovin…Thanks for the giveway! I think it’s super that you’ve taken control of your passion. The new site is very vintage and very you. I am also a blogvin subscriber & I wish you nothing but the best. The label and site are “smart” as they would say. Keep up the good work & let us see one of your creations that you drafted and completed. Just starting drafting myself. Love the new look, it looks great! I subscribed via email. Congratulations on the move- I love what you’ve done with the place so far! I’m an existing Bloglovin follower, who would love to be in the draw- who wouldn’t want to receive a parcel of mystery sewing goodies from someone like you who *really* knows what she’s talking about? Love the new look and you’ve really inspired me to get myself together and make the move. I follow you on Bloglovin’. What a great idea for a giveaway! I already follow on Bloglovin 🙂 I love your new logo. I subscribed but I was also a bloglovin’ follower before. I’m a follower on Bloglovin. Thanks for the giveaway! Great new website-look – I have now subscribed via email but have been a “favorites” follower for quite a while. I’ve subscribed. Always enjoy reading your blog. I found your blog from your comment on my blog- thank you for such lovely encouragement! I’ve signed up to follow you on Bloglovin’ (I’m there as Steph Pomfrett) and I look forward to scouring your archives! I already follow you on bloglovin and the mysterious giveaway intrigues me! Great new website! And how exciting with a secret giveaway, I want in on it. I subscribe to your blog on bloglovin’ (have been for a while). I’ve been following you for a long long time. Love the idea of mystery give away!! Count me in. The new site looks great. I’ve just subscribed to email notifications! Love the new look. I am following you on Bloglovin but I’ve been a lurker since “Maudella” I’ve always admired your style. I’m following you on Bloglovin. Oops, pressed comment too early. So happy to be featured on the same page as you on Tilly and the buttons “Your Cocos” post. I’m following you on bloglovin. Your new site looks great! Would love to be entered in your giveaway – who doesn’t love a surprise?! Already subscribed on Bloglovin’. Thanks! Well I love reading your posts, not ramblings at all. Please include me! Bonus! I came along to ‘follow’ and I find this! Excellent. As has been said many times, the blog is looking great! I already follow you with bloglovin, thank you! keep the posting going, please! Love the updated blog, Ms. O, and now know why I missed your few posts from the good ol’ WordPress reader. Nev-ah again! You’ll arrive in me inbox, which is much more satisfactory. Love your style & down-to-earth-edness about sewing! Have just discovered your blog and I have to say am very taken with those shorts, what a lovely design. Would, of course love to win the giveway. I’m just dipping my toe back into the sewing waters after many years, a mystery gift might just lure me into the shallow end. Congrats on the new look! Just started following you on Bloglovin – so much easier than just havinv you bookmarked on my phone! I had been wondering where you’d go to. I used to follow your Burda reviews and also subscribed to your previous site. I know you’d mentioned wanting to move on to do your own thing… and here you are. I really enjoy the quality of your site – yes, the sewing/projects, but also the photographs. You’ve been a real inspiration to me! And, yes, I would love to be entered in the give away! I follow on Bloglovin 🙂 I love your new logo! Look at that! I’m so excited for the giveaway that I commented twice, three times now 🙁 I’m so sorry, feel free to delete these two. I can’t believe I haven’t already been following you on Bloglovin’ but I am now. Happy site redesign, and good luck with the hosting. Congrats on your lovely new design, and on going self-hosted! I’ve been following you in my RSS reader for quite a while. Congratulations on your new look. I like it. I also really like your latest plaid creations as well. I was almost distracted from my blog reading to see if I have any suitable shorts patterns to use with my bit of plaid. I have been following you for awhile on a RSS feeder, but I have added my email address to your list of subscribers. What I was trying to say was that I love the new look and admire the change to self hosting. It’s an idea I toy with but am terrified of! I’ve added my email to your subscriber list as I’m just too intrigued by a mystery! I subscribe through Feedly – does that count. (I suspect I am a follower through bloglovin too, as I had more or less the same Feedly / Bloglovin feed, but never use Bloglovin)! I follow you through Feedly, and it looks like it’s worked just fine as all of your posts have come through! Not sure if that makes me eligible for your prize pack, but even if not, I thought you’d like to know that Feedly is still working. I’m a Feedly follower, does that count? I love the mystery behind this giveaway. I have been following you on my blogger feed but I am also following on Bloglovin now too. Hope you will stick me in the hat. Also, I love your new woven lables! I’m super proud of you! High five!! And what a compelling giveaway, oooooh mysterious!! I am subscribed via Bloglovin’ and I would love to win the giveaway! Previous PostPrevious Flora – my new bestie!